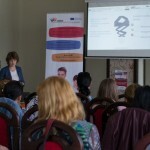 In 10 may 2018, The Iași Branch of the Order of Nurses Midwives and General Nurses in Romania organised the multiplier event “Strategies and training interventions in prevention of burnout among nuses and care workers”. 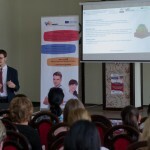 At the workshop there were 50 participants among which a delegation of four medical doctors and nurses from the Republic of Moldova. Participants received useful information about the burnout syndrome, examples of good practices for the prevention and management of the professional exhaustion that would generate positive change of attitude among health professionals.